Tens of thousands of people have taken to the streets in major international cities to demand governmental action on climate change as talks to reinvigorate the Paris Agreement continued in Thailand. The “Rise for Climate” protest movement swept over the globe on Saturday, with more than 1,000 events organised worldwide – from Bangkok to San Francisco. In the Thai capital, where talks at the United Nations’ regional headquarters began earlier this week, dozens of fishermen and labourers whose livelihoods are threatened by rising sea levels brought examples of their produce, including crabs and shrimp, while holding banners calling on delegates to take action. “I came here today to ask the government to put coastal erosion on the national agenda,” 58-year-old fisherwoman Aree Kongklad told AFP news agency. UN chief Antonio Guterres acknowledged that too little is being done, calling on negotiators in Bangkok to “show the ambition” needed to address the issues. Dozens of demonstrators turned out at a demonstration in Lima, the capital of Peru, holding signs calling on people to unite for the climate and performing street theatre that depicted the death of nature as a result of climate change. Sizeable crowds also showed in European cities. 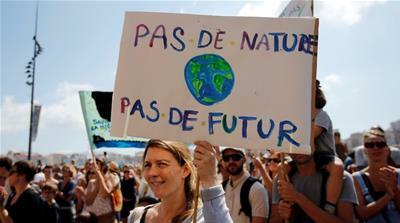 Organisers in France claimed that roughly 115,000 took part in nationwide rallies. If true, it would make the “Rise for Climate” marches the largest environmental protest in the country’s history. “This is the biggest day of climate action in France, it’s proof that the citizens are ready to demand commitments from our elected officials after a catastrophic summer when it comes to the climate,” said Clemence Dubois, the France campaigner for 350.org, a group whose website says it uses online and grassroots organising to “to oppose new coal, oil and gas projects”. Another 10,000 rallied in Copenhagen, the capital of Denmark, according to police. About 1,300 others marched in front of the European Parliament in Brussels. The Paris Agreement, which was adopted in December 2015 by 196 state parties, calls on signatories to report their progress in battling climate change to the UN. The landmark agreement deals with greenhouse gas emissions mitigation, adaptation and finance starting in the year 2020. The aim is to limit global temperature rise to two degrees Celsius above pre-industrial levels by 2100. But US President Donald Trump, whose country is of one of the world’s largest polluters, announced in August 2017 that he would withdraw from the agreement in order to renegotiate its terms. The move caused global outrage. The talks in Bangkok aim to create a draft legal framework for limiting global temperature rises that can be presented to ministers and heads of state at a final round of discussions in Poland in December. Delegates began meeting on Tuesday, but there has been little progress, according to reports. Multiple sources told AFP on Saturday that the US is stalling UN talks over how to fund poorer nations in the battle against climate change. “The US is no longer playing the game but it’s still setting the rules,” said a senior climate negotiator, who spoke on condition of anonymity.